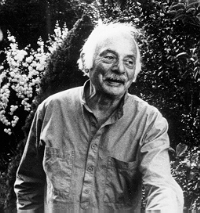 I can't confirm it via any news source yet, but the grapevines indicate that Stanley Kunitz has passed away this Sunday morning. He was getting on 101 (!) years old, was one of the kindliest looking men you will ever espy in this world (see above), was a consummate gardener, and authored some top-notch free verse. Yesterday a fellow in the music shop picked up some Wilson Pickett, and when I mentioned that he'd recently passed in January the fellow blanched as though struck: he hadn't known that the soul singer had passed, and seemed spooked that the whim to pick up a Pickett CD would strike him so offhandedly. I received this poem of his in an email. It's textbook Kunitz: a subtle, conversational tone that doesn't seem cutting or even memorable until I come to the poem's end and find that several lines have lodged themselves in my mind. I suspect that lineation's one of his strong suits, but his diction is so plain and he sounds so utterly approachable that it's not immediately clear how well these poems succeed. But what am I doing. Let's allow the man to speak for himself. After you toast your mothers today, toast Stanley. One more drink won't hurt. that my friends were given parties. Thanks, that is poetry I can relate to. I did not know about this guy but maybe now I will check my library.